If you have been keeping up with health trends lately, you’ll no doubt agree that essential oils are now very popular products for beauty and wellness. Lavender oil, peppermint oil, and bergamot oil are all gaining notoriety. Argon oil, however, has spent many years in the “shadows” so-to-speak but has since gained popularity. Argan oil is a staple of Moroccan culture and continues to play a significant role in the wellness rituals of the Moroccan people. Its benefits are universal and health-conscious industries all over the world have taken notice. With that said, it’s worth discovering the healing power of this oil for yourself. 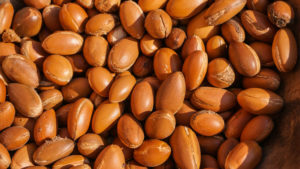 Argan oil (called “liquid gold” in Morocco) comes from argan nuts, a byproduct of the Argania spinosa which is indigenous to Morocco. The nut is light-golden brown and is known to have an intense flavour. Much of the oil itself is produced by cooperatives of women who undergo the arduous process of extracting it. The extraction and processing of argan oil provides these women with a stable income. The selling of argan oil can be traced back to the early 1500s when efforts were made to sell it to European markets. It never took off. However, opinions and perceptions of the oil have changed over the last 500 years. 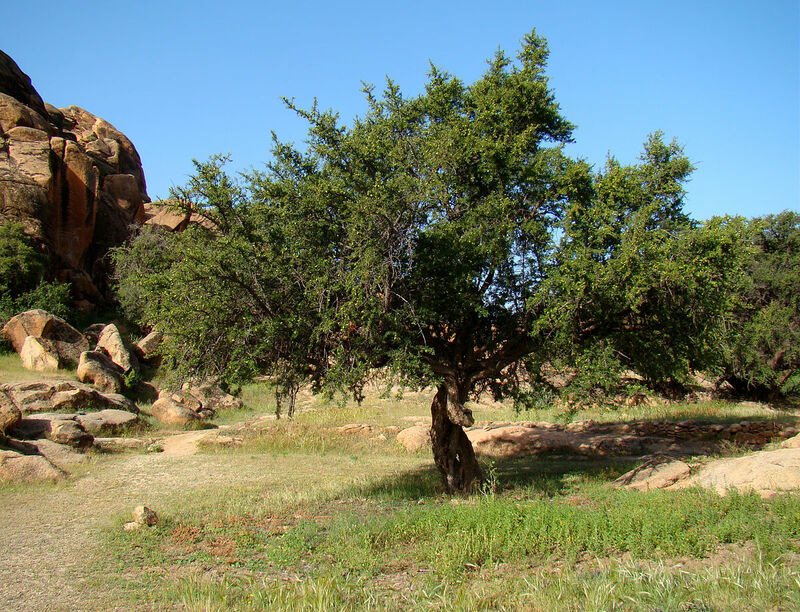 In recent years, scientific research uncovered the vitamin-rich profile of argan oil. Additionally, the Moroccan government’s initiatives propelled the crop onto the world scene, attracting attention specifically from the cosmetics industry. Now, with its many uses, it has become one of the more prized oils for beauty and wellness. Argan oil can be ingested as well, which can have positive effects on insulin resistance, heart disease, and even seizure management. With that said, there is widespread use of argan oil for the face and it is also common to use argan oil for hair treatments, as well. Argan oil has the ability to make tough hair softer, silkier, and shinier. It’s a truly delightful product for individuals who deal with frizzy hair and/or split ends since it can soften tougher hair textures. Closely related to the point above, argan oil keeps hair soft, making it easier for people to style and shape their hair. Therefore, argan oil can be used as a styling agent that can help individuals achieve and maintain their desired hairstyle. Dry skin is a daily dilemma for many. Argan oil is rich in vitamin E, which is known to promote healthy skin and is the ideal treatment for those who regularly deal with dry skin. Argan oil’s compounds can give skin a more vibrant glow and can reduce the visibility of wrinkles. The result is more youthful looking skin. Additionally, it can restore the skin’s elasticity, making it feel more plump and soft. Argan oil is a great treatment for cuts and wounds, especially ones that may be a bit slow to heal. This is because it is rich in antioxidants and vitamin E. It can be used for people with athletic or outdoorsy hobbies or for children that are prone to sustaining injuries in sports or other activities. For most individuals, stretch marks are unpleasant to look at. For pregnant women, it often feels like a necessary evil. Argan oil improves skin elasticity, which will naturally reduce the appearance of stretch marks. Acne is a plague for young people, especially teenagers, but also younger adults in their 20s and 30s. Argan oil removes excess sebum – a buildup of which causes pimples – reducing the severity of acne. Although argan oil has become a hot-button beauty product, it is also becoming a staple for many wellness procedures, namely, massage treatments. At Farnatchi Spa, we use argan oil for our ILA massage treatments for the purpose of scrubbing the body to rejuvenate the skin. Argan oil can be used as a whole-body moisturizer and cleanser, which is another reason why we add it to the ILA regimen. Argan oil is referred to as liquid gold for a reason. It is a powerful and natural treatment that comes exclusively and proudly from Morocco. It has its benefits when ingested, but argan oil is rapidly becoming renowned for its revitalizing power for the hair and face. You can use it more as a cosmetic product or you can feel its therapeutic effects in combination with the healing hands of an ILA massage practitioner. No matter the method or the purpose, you owe it to yourself to experience the healing power of argan oil. It may be the best treatment for your skin and hair yet!